With the kids nearly out of school and the great weather all around us, we can’t help but think of getting away. Leaving the hustle and bustle of the city for the quieter and more peaceful surroundings of being near nature is one of many people’s favourite summer activities. We may have grown up camping during our childhood or we may just enjoy connecting with the outdoors and nature. Either way, summer is definitely the season to spend more of our time outdoors. Many of us enjoy the summer on or in the water. We bring our kayaks, canoes or stand-up paddle boards to the cottage or campground. Or, we may even want to make sure that we maximize our time outdoors while getting more exercise when we’re on vacation. We may want the whole family to cycle to the general store, the beach or around the campground while we’re away. So, we’ll want to haul the bikes on a rack at the rear of our vehicle or SUV. The Thule or Yakima racks, hitches and cargo boxes make it all possible for us to carry sleeping bags, tents, kayaks, bikes and much more for the summer adventure but when it’s time for the family to return home, where will we store it all? Well, we have some garage storage solutions that make it easy and convenient not only to store the gear but also make it easy to pack up our vehicles for the adventures that await us this summer. 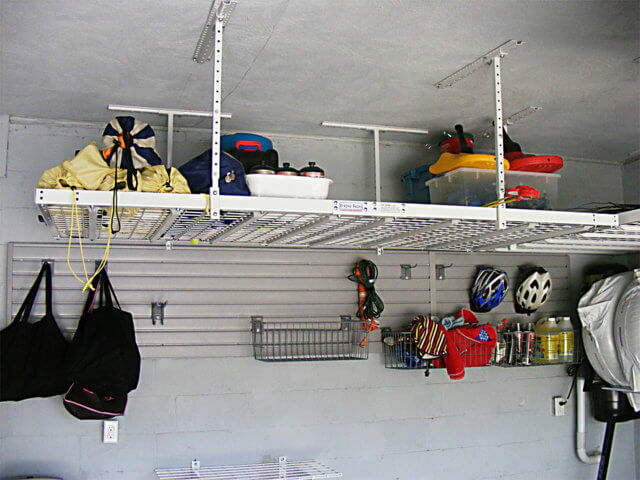 Of course, overhead storage solutions is the best way to get the most out of our garage space. This allows us to keep things out of the way until we are ready to use them or access them frequently. Let’s discuss some of the garage storage options. Or, you can get a complimentary in-home consultation for a garage renovation to discuss how to use the space overhead to maximize your garage for your family lifestyle. Not only are the hydraulic lifts an easy way to whisk bulky items upwards and out of sight, they are also easy on people who want unload or retrieve those bulky items safely from their location up high. 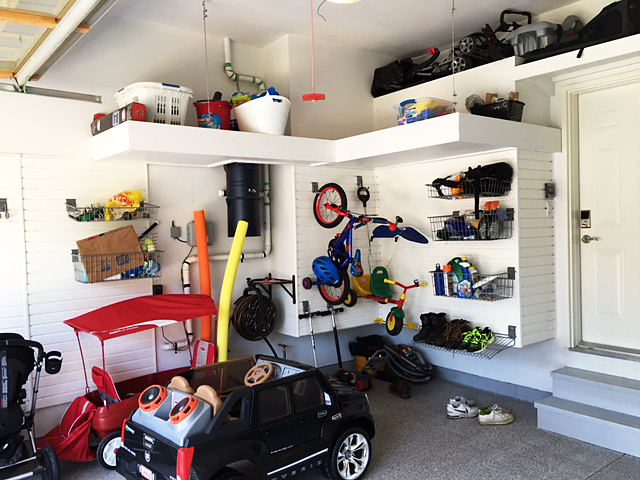 Most families use these hydraulic storage lifts to store bulky items such as Thule cargo boxes, bikes, kayaks, canoes, stand up paddle boards and golf clubs into the empty overhead spaces. So, whether you’re over 6 feet tall and the strongest member of your household or you’re 8 years old and trying to retrieve your bike to get to school, the hydraulic lift can be operated by just about every family member regardless of the their size, strength or stature. 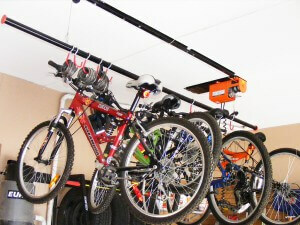 An option to the hydraulic overhead storage lift is the manually operated lift which can be installed safely and securely to hold a few hundred pounds of bikes, sporting gear or cargo boxes. 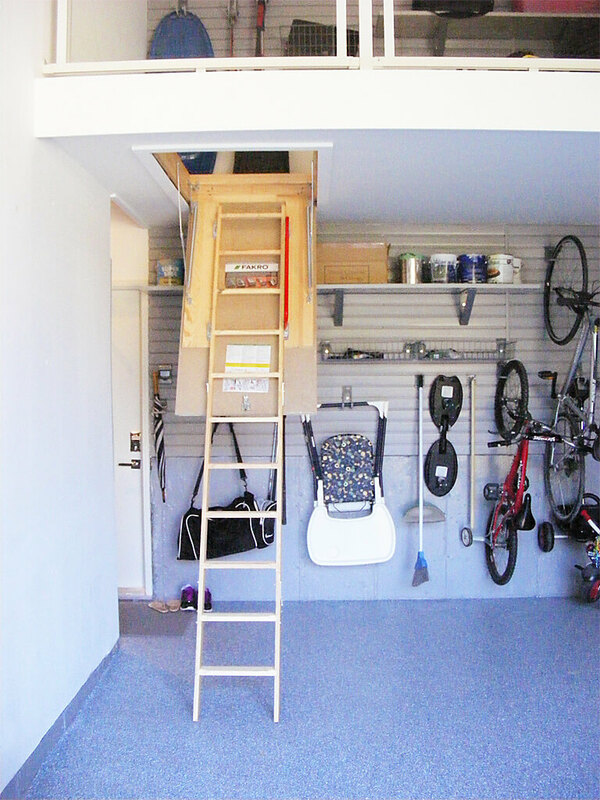 Any of the lifts can be positioned to lower to an exact spot in the garage for handy retrieval or mounting. For instance, many of our lifts for Thule racks and cargo boxes are positioned so that when lowered, they will sit directly over the vehicle’s rack system. From there, just strap the cargo box securely to the roof of the SUV, minivan or other vehicle and it is ready to load with the family’s toys and sports gear. One of the most versatile of the overhead storage mediums is the custom made-to-measure overhead platforms which are secured to the ceiling with airline cables making them capable of supporting several hundred pounds of items per square foot of space. Undermount pot lights add visibility for a workspace just below or to the overall brightness of the garage. The whole platform can be finished and painted to match the colours of the garage. 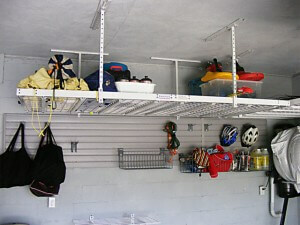 They can run along the sides and back wall of the garage so that it optimizes the overhead storage space. The platforms are designed just deep enough so that most adults can reach to the back of the platform and retrieve any item stored along the back edge against the wall. Using overhead storage to store items which are not in season or used rarely is the ideal way to leverage this type of storage medium. Some examples of storage items include seasonal items such as tires which are swapped twice a year or holiday decorations which are used once a year. When it comes to sports equipment, snowboards are accessed frequently throughout winter but then, it becomes wakeboards in summer. Tools such as snow shovels and salt in winter which are required weekly or daily are then swapped out for rakes and lawn mowers which are necessities to maintain our yard or garden in summer. 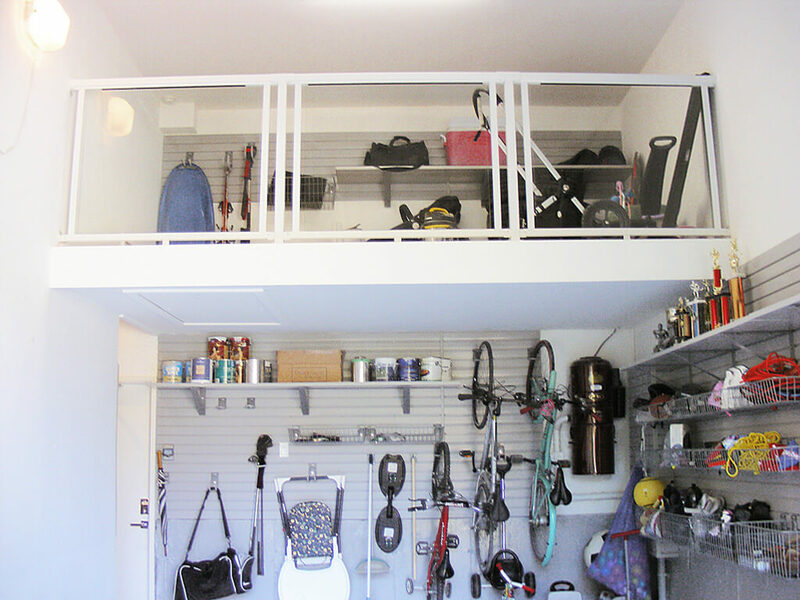 Overhead storage racks are typically stainless steel with a mesh platform so that items stored on it can be seen from underneath as well as all four sides in many cases. Again, they do need to be mounted to the ceiling securely but once this is done, they can carry anywhere from a few to several hundred pounds worth of your belongings. Because they can be accessed from all four sides, the rack can have a larger dimension but not too large that people can’t reach the centre of the rack for the item that gets tossed there. A lot of people use these racks for things such as tents, sleeping bags and other items which require a bit more storage space while also needing some air circulation. Both the racks as well as the platforms may require a step ladder for people to retrieve or store the items. Now, if the garage is quite tall then there are some additional custom built solutions which are also easier to use. The storage mezzanine comes with a glass railing so that it is easy to see the items being stored above and prevents things from being knocked off the mezzanine. Built-in stairs or a pull-down loft ladder which lower to the garage floor and tuck away flush with the mezzanine floor make access to the mezzanine convenient. The stairs are weighted so that they only require a small effort to pull down or push back up into place. Because family members are meant to walk up onto the mezzanine, it is sturdy enough to carry people as well as a wide variety of belongings. Some of the access options include the elevator style electric stairs or ladders or in one case, an auto lift was used to port the homeowners to the mezzanine level to retrieve stored items. Each mezzanine is made-to-measure with options to suit the homeowners and their families. If you are in need of some extra storage space, all that we need to do is look upwards for the answer. To plan a garage renovation, start with a complimentary in-home consultation to understand the full range of possibilities that would suit your garage and your family’s lifestyle.